Troy Deeney deserves an England call-up because of his "positive evolution" in the Premier League, according to Fulham manager Slavisa Jokanovic. 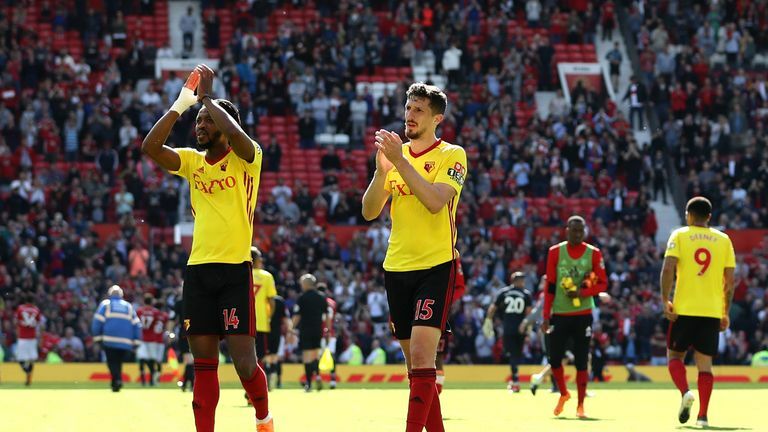 Former Watford boss Jokanovic will come up against Deeney and the Hornets in Saturday's league clash at Craven Cottage, live on Sky Sports, and the Fulham boss hailed the striker's consistent top-flight progress. "He's strong and a big character, and sometimes it's not easy to deal with him," said Jokanovic. "He has had a positive evolution in the last few years. Really he can be an option for the England national team. "He had a great season when I worked him with, and his dedication is very high." Jokanovic rejected suggestions that Deeney is a throwback-style centre forward, insisting he has developed his game enough to cope in England colours. The Fulham boss admitted current Aleksandar Mitrovic boasts similar attributes to Deeney - but again refused to impose limits on the Serbia star's abilities. "Old-fashioned, I don't know about old-fashioned," said Jokanovic of Deeney. "Probably we could judge Aleksandar Mitrovic like an old-fashioned player. But he's already a good player, with a great character who is up for the fight. "I like this kind of player. I can be an old-fashioned coach too. I think Troy Deeney can play at the highest level. "He has a few seasons in the Premier League behind him, and he has always shown high quality. "Other players have different characteristics but for Troy Deeney he's not easy to handle. "He's definitely an unusual player and you can use him in different ways. My point for you is he's a player who can have at some point a chance to play for England. "I'm happy with Mitrovic: he's a new style, old-style player. I try to find balances between styles of players. Seri to pull the strings? "Deeney and Mitrovic are both very good players. It depends how you want to play. "Mitrovic is not the kind of guy who you send chasing the ball and running in behind. You have to play a certain way with that kind of player."